Sidepanels Ad spec - Nine Entertainment Co.
Sidepanels enable advertisers to reach audiences with unrivaled interactivity and engagement. This ad units can offer the full range of creative executions and can also adhere to the header of the page and follow the user down the page as they scroll. Nine Digital hosted sidepanels allow for 2x viewability tracking scripts (left & right panel) to be inserted, if provided by client. 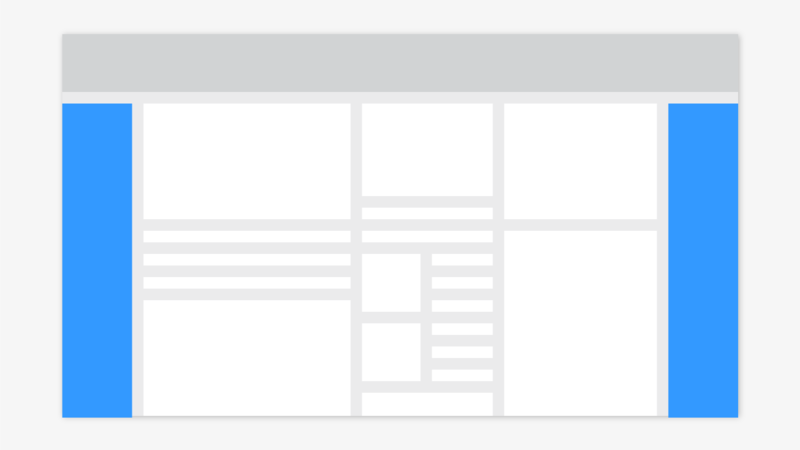 Third Party hosted Sidepanels should launch from a 1x1 ad (both the left and right panels expand simultaneously from this). Sidepanels should have a solid background colour and fade to transparent at the bottom and sides. All transparent areas should not be clickable. Animation (3rd party served only) in the side panels is allowed, and can only play once with no looping. Flashing, blinking or excessive animations will not be approved. If animation is activated by hovering then it needs to end when the mouse is moved off the animation/ad. Advertiser logos must be positioned beneath the site logo (approximately 200 pixels from the top of the panels). A maximum logo size of 130px x 40px will be permitted. Positioning should align the sidepanels flush with the billboard position. 3p hosted sidepanels can be sticky and adhere to the header of the page as the user scrolls down. No text or images to be placed within 95px from the top of the panel. Maximum one product graphic and one price point and/or product message is permitted per panel. Additional price points and promo text to be housed within the 300x250. Messaging elements must not be repeated across both panels. Sidepanels should have a single background colour or single photographic image and we request low intensity / muted colour for maximum engagement. Key messaging must be presented in the top right 125x600 of the left panel and top left 125x600 of the right panel.